Gold bracelets are like having money wrapped around your wrist! Sell your unwanted gold bangle bracelets, gold link or mesh style bracelets and turn them into cash today! Gold bracelets can have substantial weight to them. A large solid gold ladies or men’s bracelet can easily contain two to five ounces of gold worth thousands of dollars! We buy gold bangles, gold link bracelets, gold bracelets with diamonds and gemstones, and we even buy diamond tennis bracelets! 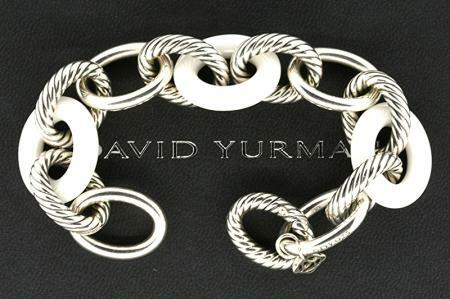 This awesome bracelet is the largest link size available, and the white version is very rare. Currently available on Yurman site in black ceramic only for $775. You can no longer buy the white version on the website! Sell your unwanted gold bracelets to Cook County Buyers. As you can see in the photo, gold bracelets come in many different forms. Some have gemstones, others called tennis bracelets have diamonds. Solid gold bracelets that do not flex are called bangles as seen in the photo. 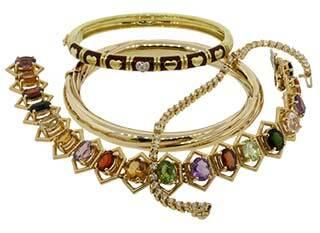 The good news is, we buy any gold, diamond or gemstone bracelet! Just like a stock broker may check the current price of a stock, gold dealers view the daily price of gold to determine purchase prices. Websites like Kitco and Gold price feature an easy to read view of the action in gold price at any given moment. You can see the current gold price here to the left. Cook County Buyers will always check the current price to ensure you receive the most for your gold! 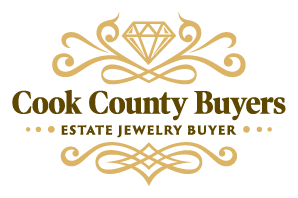 Cook County Buyers is a great choice to sell your gold bracelets. We are available days, evenings and even weekends including Sundays to meet with you at your convenience. My private office in Skokie IL is available by appointment or you can choose to meet at your preferred coffee shop near home or work. Give me a call now!